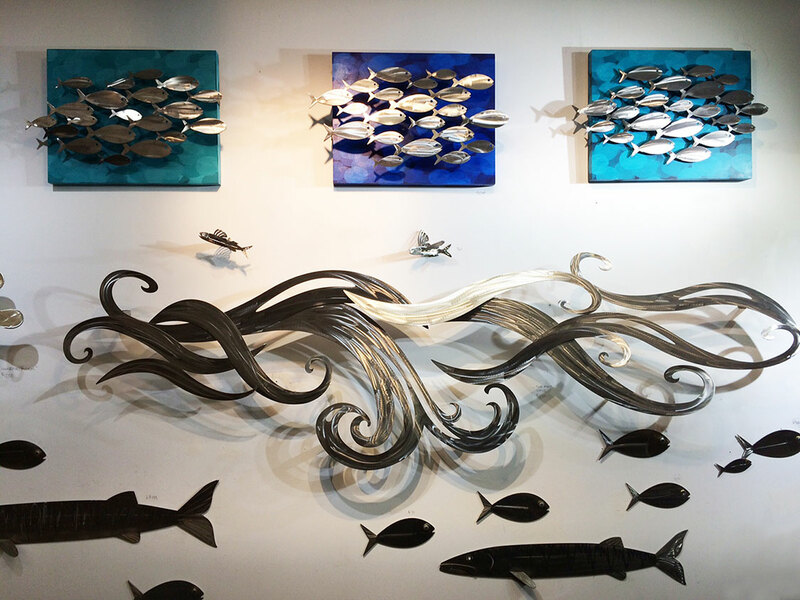 My name is Christopher Erney, I have a sculpture studio at the Torpedo Factory called MetalShop33, located three miles south of Washington, DC on the waterfront in Alexandria, VA. 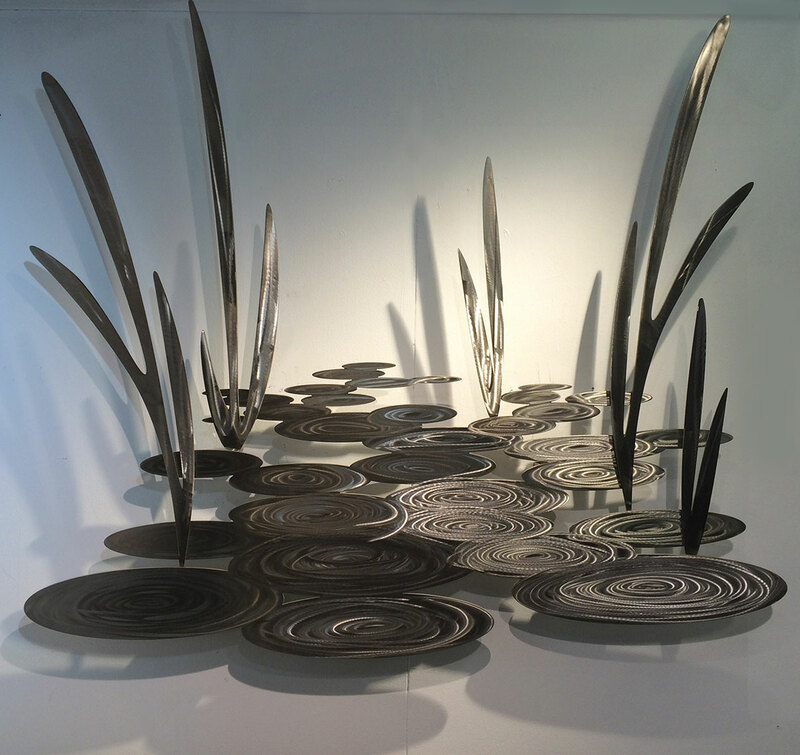 I create custom dimensional artwork in many materials, but primarily in stainless steel. If you want color, I have pieces that are mounted to painted wood panels as well as the ability to add a transparent layer of color directly on the stainless steel so that metal shine and optical effects still shows through. 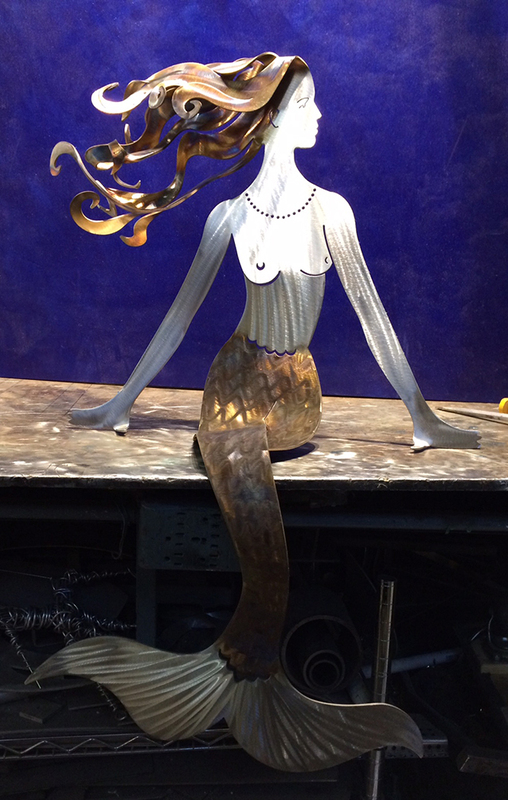 The beautiful stainless steel mermaids come in two sizes, the small size (12″ High) the large size (24″ High). 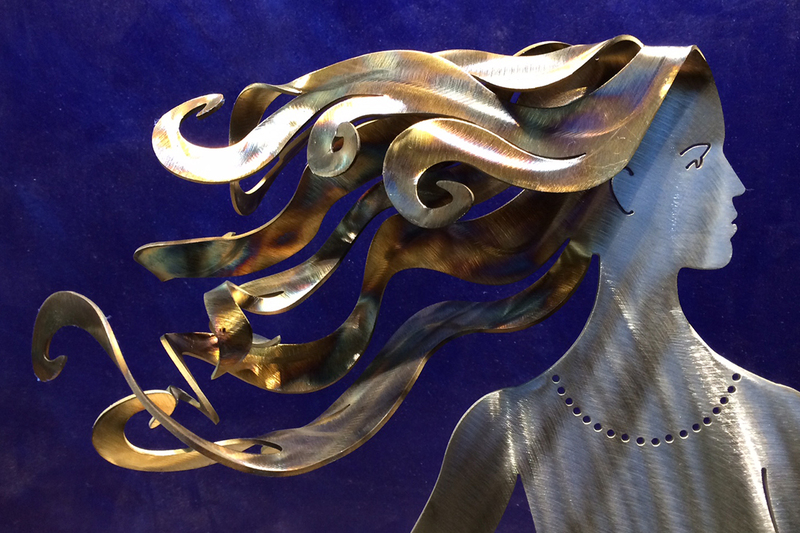 The mermaids feature heat-treated hair and fish tail parts. These can sit inside on a table or shelf or decorate a garden wall or patio outside as well since they are coated in a 10-year clearcoat. I also have three sizes of Sharks! -made of stainless steel and feature heat-treated iridescent “blu-ing” of the steel along their top fins. The small size Shark! is 18 inches long and just like it’s big brother has a pre-drilled hole in the top fin so it can hang if desired. The Medium Shark! is 36 inches long and made from heavy 1/8″ thick stainless steel. The largest Shark! is a whopping 60 inches -five feet long! 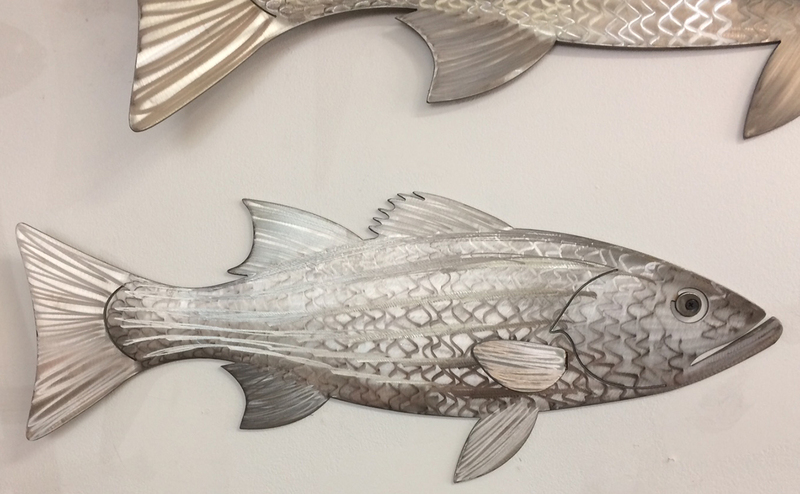 This stainless steel beauty is sure to make a big impact no matter where you display it! 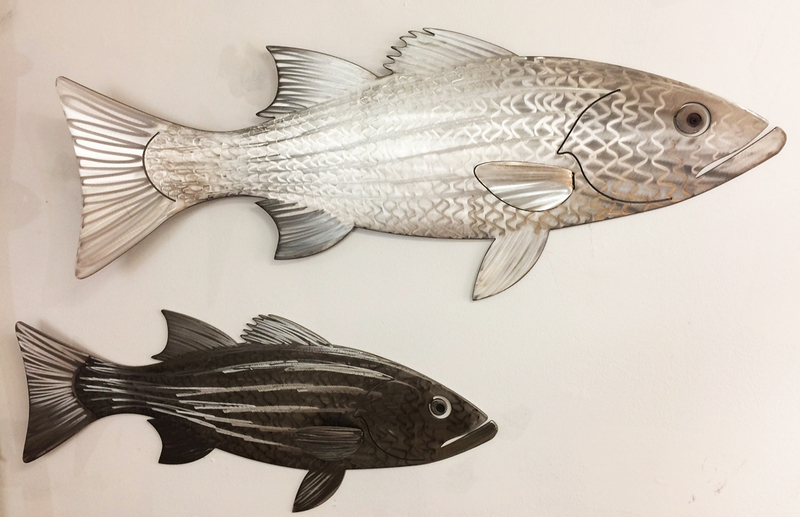 New for 2017 are some really great looking striped sea bass -also known as “Stripers” or “Rockfish” they are available in 28 inch and 36 inch long sizes. They catch the light and their look changes from light to dark depending on your viewing angle. Below (left) are the pair together and (right) a close-up of just the smaller fish (from a different angle) so you can see the dramatic change as you walk by. 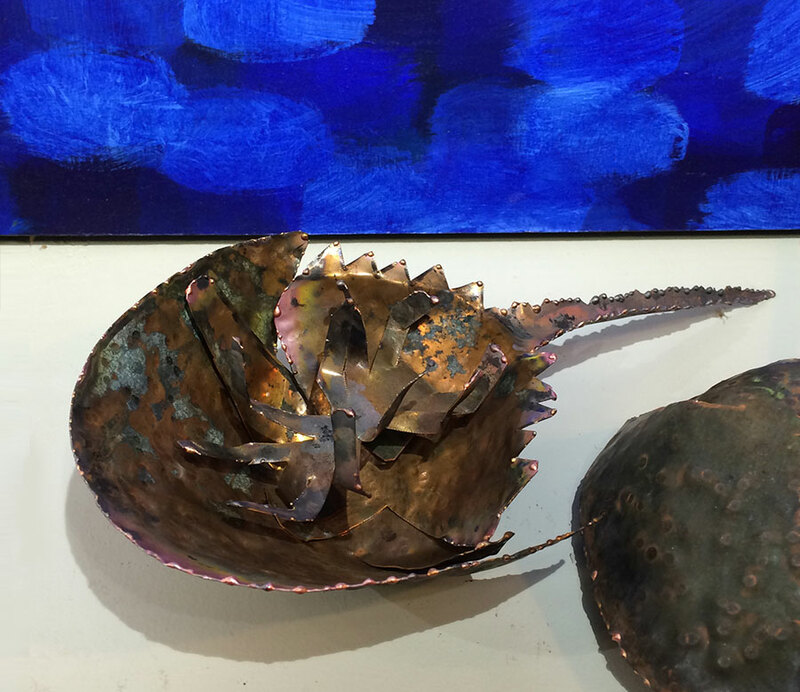 Blue crabs and Horseshoe crabs have taken over the MetalShop! Luckily, a few mermaids also stopped by to distract the crabs long enough for me to put sale tags on those pesky critters. 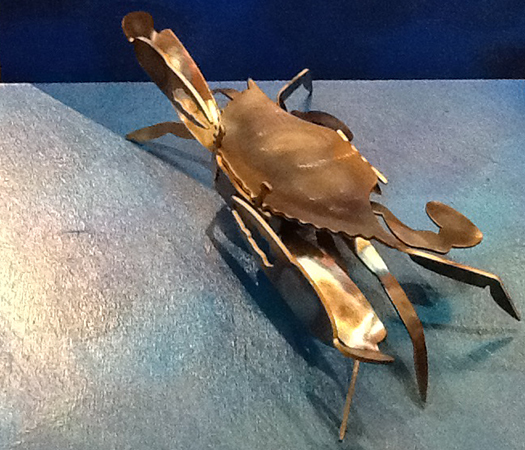 Blue Crabs made from heavy-weight stainless steel or Horse Shoe Crabs made from aged copper. These make a great gifts!